Mt. 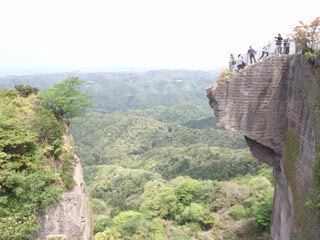 Nokogiri-yama (鋸山) is the stone-mountain located in Awa, Chiba. The Entire mountain is inside of the Nihonji Temple(日本寺). There is the wonderful landscape of Tokyo Bay, Boso Peninsula, and Miura Peninsula at the top of this mountain. From the famous cliff spot, Jigokunozoki(地獄覗き), literary means hell watch stand, you can see the bottom of the cliff from out standing rock. There are over 1,500 Buddha statues, great Buddha and great Kannon in this mountain. Mt. Nokogiri is actually Nihonji Temple which is the oldest Buddhism temple in Kanto built in 725. The name “Nihon” is the also the name of Japan and it has been given by the Emperor Syoumu(聖武天皇). It becomes Soto Zen Buddhism in Shogun Iemitsu of Tokugawa government. Many famous Buddhist monks trained at this temple for over thousand years. The name of Nihonji Daibutsu is Yakushirurikonyorai(薬師瑠璃光如来), and represent the entire the space is the pure land, and it leads the world to the peace and safe. It has 31m high and as the sitting great Buddha statue, Hinonji Daibutsu is the biggest Daibutsu in Japan. Original statue was built in 1783. However, around the end of Edo period, the damage by weathering, it lost almost the all shape until 1966. In 1969, it has been fixed.